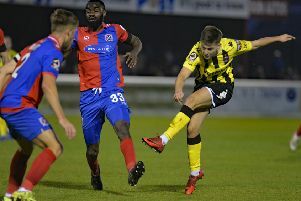 AFC Fylde fell at the first play-off hurdle as they challenged for promotion in their debut National League season but Neill Byrne is convinced they can do even better in 2018-19. Centre-half Byrne was battling in the lower reaches of the table as Gateshead captain last season but looks forward to competing at the right end next term. He said of the Coasters’ promotion goal: “I think that is the ambition of every player in this division. Everyone wants to get into the Football League and progress their careers. “Having seen Fylde narrowly miss out last season, hopefully we can push on and achieve promotion next year. That has to be the ambition of every single player in our dressing room. “I don’t feel like there was a standout team last season, every game was tough. Now we have Chesterfield and Barnet coming down, plus Salford and Harrogate coming up who are both financially very stable. Byrne made 51 appearances for The Heed last season and now hopes to become a mainstay of Fylde boss Dave Challinor’s plans. “I’m still young and I have a lot to offer, but I still want to improve,” he said. “I like to think I’m comfortable with both sides of the game as a defender. I’m a decent size and good aerially, but I also like to get the ball down and play. I’ve also had plenty of experience already for my age. “One thing I can guarantee the fans it that myself and everyone around me will be giving 100 per cent in training and on matchdays. “I have come here to progress and play games. I played 51 games for Gateshead last year and managed to stay injury-free and that’s what I expect this season too. “There will be competition for places but that’s healthy. “It’s what drives you on, but I want to play every game and it’s up to me to impress the gaffer and make sure, come the first day of the season, that my name is on that team sheet. “I will enjoy the summer, but I’m really looking forward to getting stuck into pre-season in a few weeks.